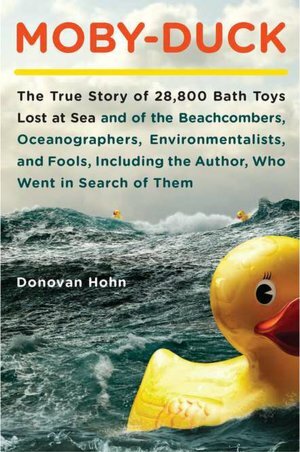 The full title of Moby-Duck by Donovan Hohn is Moby-Duck: The True Story of 28,800 Bath Toys Lost at Sea and of the Beachcombers, Oceanographers, Environmentalists, and Fools, Including the Author, Who Went in Search of Them, which really rather nicely encapsulates what this nonfiction book is about. An accident happens at sea and a container ship accidentally dumps 28,800 plastic bath toys (7,200 red beavers, 7,200 green frogs, 7,200 blue turtles, and 7,200 yellow ducks) into the Pacific ocean. Hohn writes: "We know where the spill occurred: 44.7 degrees North, 178.1 degrees East, south of the Aleutians, near the international date line, in the stormy latitudes renowned in the age of sail as the Graveyard of the Pacific, just north of what oceanographers, who are, on the whole, less poetic than mariners of the age of sail, call he subarctic front. We know the date - January 10, 1992 - but not the hour. (pg. 9)" After the spill beachcombers began to find the bath toys and a legend grew out of the initial news story that placed duck sightings from the spill even in the Atlantic. Donovan Hohn goes in search of the bath toys trying to discover where they beached. This lead him to investigate plastics and what they are doing to the oceans and shorelines. His research also leads him to investigates ocean currents, gyres, shipping, Chinese toy manufacturing, and the arctic, among others. So, while Moby-Duck is ostensibly about the plastic bath toys lost at sea, they really become a rather small portion of his eventual investigation and travels. While there is a wealth of information here, I did end up wishing that Hohn had concentrated on the bath toys lost at sea. What originally intrigued him enough to inspire the book also captured my imagination and made me want to read it. While I did enjoy it, it became a rather slow read full of more information than I was originally anticipating. It helps that he is a good writer and has a nice way with descriptions and imparting information. Hohn includes a selected bibliography and notes, which I always appreciate in nonfiction. Highly Recommended - but know it's about much, much more than the missing bath toys. But questions, I've learned since, can be like ocean currents. Wade in a little too far and they can carry you away. Follow one line of inquiry and it will lead you to another, and another. Spot a yellow duck dropped atop the seaweed at the tide line, ask yourself where it came from, and the next thing you know you're way out at sea, no land in sight, dog-paddling around in mysteries four miles deep. You're wondering when and why yellow ducks became icons of childhood. You want to know what it's like inside the toy factories of Guangdong. You're marveling at the scale of humanity's impact on this terraqueous globe and at the oce­anic magnitude of your own ignorance. You're giving the plight of the Laysan albatross many moments of thought. I explained the plastic-poisoning hypothesis.